This page holds the children's creative and historical writing produced after their research and meetings with the bus workers. You can also download the booklet with their writing, photos and more information about the project. Just click on the image above. I am now in Paris. France and I am lost for words. I have just witnessed one of the most spectacular things l have ever seen. It was a huge cart being pulled along by 2 horses and it was transporting a crowd. This was no ordinary kind of cart - the French people call it an “omnibus”. It goes on the same consistent route back and forth all day and people pay to get on and travel where they need to go. I was mesmerised by this creation and I really think that this idea could spread across the world. I am thinking about bringing this idea to life in London. This could change people’s lives forever and might make me some money too! I am thinking about taking this idea to the next level by making it bigger, to carry more people and adding an extra horse to make it easier to go to further destinations. The newest bus in 1910 was the B-Type, which took 34 passengers and moved at 12mph. When the First World War started, the army didn’t have a way to move soldiers around so they took nearly 1,200 of these B-Type London buses to Europe along with their drivers. The buses were repainted for camouflage and each bus window was boarded up for protection. Buses were put to different uses by the army. Some had pigeon coops attached to the roof to carry the homing pigeons used for sending messages, others carried wounded men or ammunition. The buses sometimes broke down and some bus drivers were killed. Only a quarter of the buses came back after the war. It’s been three weeks. Three whole weeks in this hell; just a few weeks ago I was driving from Paddington to Bank and now I’m in the middle of a war. I’m just a bus driver I don’t know anything about guns or ammunition; I’m just a young chap from London. It was only three weeks ago that I was driving my B-type bus in London and now I just want to go back home. I NEVER imagined myself on the Western Front. God knows I just want to go back to the days where I’d wake up and get dressed in my uniform and drive all around London in my bus and pick up people and take them from place to place; instead I am woken up by yelling and screaming and having to put on filthy boots and step out into these hell holes that they call trenches. What have I done to get myself into this position. Not ever have I wanted to be a soldier, I mean sure all boys say that when they where younger but that has never been my dream; no matter how boring or silly it sounds all I’ve ever wanted to be is a bus driver. I know I can’t turn back time but if I could, I would do something, anything to stop this war. I can never un-see the things I’ve seen, I can never un-hear the dreadful yells, screams, cries I’ve heard; all I can do is fight. But I don’t want to fight! Never in my life had I imagined that I’d go from driving around London to dodging bullets. All the people I’ve talked to down here say this fighting, screaming, pain gives them adrenaline and they tell me to cry them a river and get over it but I can’t! I am so happy that my dad Eric Kennington was asked by H.T.Carr to paint heroes. As you know, my dad is a sculptor and an artist and he was asked to paint these two people, Mary Morgan and Albert Coe. When Mary Morgan was on her bus-stamping tickets, out of nowhere a bomb dropped and exploded and she bravely saved two children by moving them out of the way and protecting them with her jacket. Mary got really scared and started to put on loads of make up. I tried to tell she needed to show her natural beauty but she still didn't listen to me. Albert Coe's story was also very touching and he made me feel I was there. When he was driving his bus, a bomb fell and it made a huge hole and his bus fell into the hole it made, but he survived. So he crawled out and started to drag the people who were inside the bus to safety. Now Sir Alan Patrick Herbert is going to paint him. Albert Coe said he doesn't understand why he was chosen and he was only doing his job. I am so happy to be part of this today. In my eyes these two are heroes. My name is Sulil and I am a bus conductor. I am originally from Barbados and I came here because I was given a job as a conductor. It is really fun driving all day and visiting new places. I love meeting new people and making them smile. Very rarely I have to send someone of the bus for bad behaviour. The worst thing about my job is that I have to help the driver clean the mess that passengers make such as mud on the seats. To prevent this from happening we have new rules to make our job easier. Once, as I was doing my job, people came to me and said I shouldn't be doing this job because I did not come from London. I thought that was mean because everyone is equal and we all deserve the same amount of respect. Even after this incident I still love my job! It was driven by 3 horses on a very nice trot! It looked as if everyone was doing a wiggle! For the sake of elderlies there was also a rack! When men looked at women’s privacy - bad men! There was also a roof for the driver’s head! And at the bottom an engine instead of horse’s hooves! It was so good that nobody would fall! You swipe your oyster card, which isn’t a fuss! People sometimes end up falling face down. While the ‘Clippies’ ask for the fares. The people of London enjoy the ride. In 1829, London was chaotic. Everywhere was busy with carriages and people on foot. This all changed when George Shillibeer launched the Omnibus in London. It was London’s first form of public transport. It could comfortably carry 22 people inside and was pulled by three horses. Shillibeer also made a private Omnibus for Newington Academy for Girls making it the first school bus. Although his business failed, many other bus companies took its place. In 1910, the B-Type Bus was introduced, the first reliable motorised bus, and the first red bus. This time it was run by the London General Omnibus Company (L.G.O.C.). Shortly after its introduction, the First World War broke out. This led to the B-Type buses going to war, transporting troops. More recently they have been given the nickname ‘Battle Bus’. In 1931, the Trolleybus, like a bus but powered by electricity, came to London. It lasted thirty years. Eight years later, the RT was introduced. 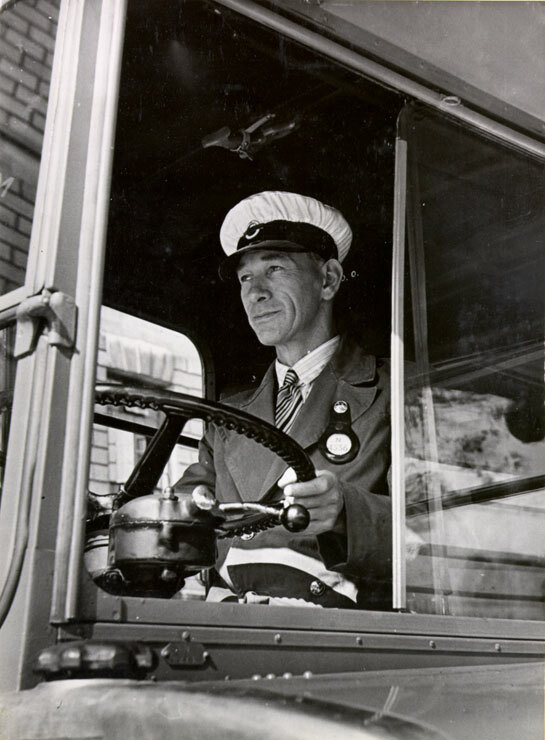 Many bus drivers hold the RT dear to their heart. It evolved from the B-type, with the open ‘Hop on, Hop off’ end now inside the body. In 1956 London said “hello” to a new type of bus. Some consider this bus an old legend. Others think the men who designed it were living gods. The RM-Type bus. The Routemaster. The Routemaster was a double-decker bus, 27 ft long and 14 ft tall; designed by London Transport and built by the AEC Company and Park Royal Vehicles it ran on diesel fuel and was painted bright red with an open entrance at the back and 64 seats. 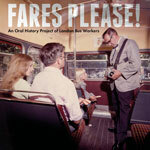 It launched on routes in London in 1956 and from then gave phenomenal service to its passengers. A total of 2,876 Routemasters were built, most for London Transport, although some buses were built for British European Airways and the Northern General Transport Company. This bus became a symbol of London, its heritage passed on to buses of today. The Brits immediately fell in love with this bus. It has remarkable recognition throughout the world. No bus has been more celebrated than the Routemaster. The last Routemasters drove up to December 2005, although 1,280 are still around. The latest version is the 2012 New Routemaster, with the rounded shape, the back entrance, the red paint it is instantly recognised as a London bus. Hello, my name is Mary Morgan and I am a clippie. I come from Poplar just down the road. In November 1940, a bomb dropped NEXT TO MY BUS! I didn’t know what to do. I saw these two darling children, so I saved them with my coat. When I got off my bus, everybody said I was a hero, but the only thing that matters is that we were all okay. The next day I was surprised to be contacted by the artist Eric Kennington to come to his studio so he could paint my picture. I was nervous and shaking with fear and when I put make up on, I looked in the mirror and gulped. He told me that I needed to wash it off before he could make a start! I’d put too much on! I am nervous to see how it turns out! Oh my, I can’t believe what just happened, I am so shaken up but feeling so grateful to be alive. I was walking down the street minding my own business when I hear a yell “Get Down, Get Down!“ At first I pass it off as a mother telling her child to get down off a wall or something but no, just a few seconds later I hear an explosion and I curl up into a ball thinking ‘this is it?’ But I don’t feel anything, and I look up to see a middle-aged woman shielding me and another child with her jacket; she appeared to work on a bus, maybe a ‘clippie’. I look up at her tears and she gave me a warm smile that calmed me down somehow; I smiled gratefully up at her giving her a hug, she hugged me back and the other child. “Thank you” I said, happiness finding my voice “You saved my life”. When I finished she smiled lightly and put a hand on my shoulder. “I’m Mary Morgan and anyone would’ve helped”. With that she left, as did the other child. I raced home to tell my parents how a women called Mary Morgan just saved my life and I couldn’t be more grateful that she was there, otherwise I wouldn’t be here. I'm Albert Coe and I am from England! I am a bus driver. I was on the number 88 bus on the 14th October 1940, when it all happened. The big explosion! This is how it all happened! I was driving my bus on a very nice day, everyone was enjoying themselves. But then it all happened, the big EXPLOSION! A really big bomb hit my beautiful bus, but that is not all, it fell into the BHL station and killed 68 people. (Can you imagine that!)? It was really hard trying to save all of those people. I tried my best to save them. I dragged as many of the people as I could, and took them out of the bus. I don't know exactly how many people I saved. "I can't make out why they chose me to paint". A young man came up to me in the street at home in Barbados and asked if I would like a job in England as there were difficulties at this time hiring enough workers for London Transport. I already had a job in Barbados but this opportunity interested me as I could make money and see another part of the world. Three weeks later, after saying goodbye to all my family and friends, I made my way to England. It was really hard at first, as I needed to get used to a new culture and deal with the fear of people being racist towards me. But I really looked forward to my new job as conductor on a RM (although I honestly didn’t know what RM stood for). After a while I found my place in the London Transport community and I found out that RM stands for Route Master! I can't believe what happened to me today. A boy tried to get away with not having his ticket! But not on my watch! I'd seen that too many times. I asked him for his ticket but he just pretended that he couldn't hear me so I said a little louder, "Can I have your ticket please?" and then he started crying! Later on, when I'd finished my lunch, a bunch of girls tried telling me they had already given me their ticket! But I am not stupid, they had just got on, but then the story changed completely, turns out they were relatives of the conductor so he let them on for free. The worst thing that happened to me was some little boy ran past me and stole my ticket machine! Not only did the string around my neck leave a mark, but as he ran away, the bus started moving so I could not go after him. I had to go back to the depot without my ticket machine. When the manager saw me he asked me what had happened so I told him everything, exactly the way it happened. But he didn't believe me! He said I probably just lost or broke it and I was making excuses! And when I told him that I was not lying, he said I was answering him back and then I got fired. This day was rubbish. Revs of the engine on the London streets. Omnibus was the first bus. At the time of WW1 they sent buses to 'The Front'. Sounds of horses replaced by horns. Effortlessly gliding around the streets. Regal, patriotic, pride of London. On the bumpy cobbled roads, it bounced up and down. Mothers and children had priority. In the carriage people jumped. Bus driver was on top. Using the whip to strike the horses. Rushing down effortlessly, as slick and fast as a jet. Elegantly swerving from, as it turns among London’s cobble ways. Mourning over the buses of the past: its great ancestors. Auburn paint enveloping the well-made structure. The Routmaster has come and went, but will be the city’s lasting icon. Evening lights comes on at night, caring for passengers’ sight. Roars from the vibrant engine travel through the raging fire within. Riding on the cobbled streets of London. Over-taking small, useless, minuscule cars. Unspeakable red, shining beauty winking as it rides by. Excitedly pouncing on ready to glide through the paradise streets. Agitated children looking out the window or pretending to sleep! Sleep or sneak the conductor always catches you out. Take a chance; you're kicked off the bus! Enchanting the children as it rattles down the street.